Feels like spring! With temperatures in the 70s this week, I was propelled to do a little work in the garage. Nothing major, but I finally gathered all the boxes we flung into the garage on Christmas Day, plus all the ones we tossed on top of the pile in the months since. I even got them all out to the curb in time for the recycling truck. Okay, there’s still one giant box from the new desk in our bedroom and a stack of styrofoam, but I plan to break that down and get it into next week’s garbage (unfortunately, it seems there is only one recycler of styrofoam in Illinois, and it’s not that close). Now the kids can find their scooters and there’s an actual path from the door to the van that isn’t strewn with crumpled wrapping paper and plastic grocery bags. The next day I took the string of snowflake lights down from the porch and put away the basket of snow toys. 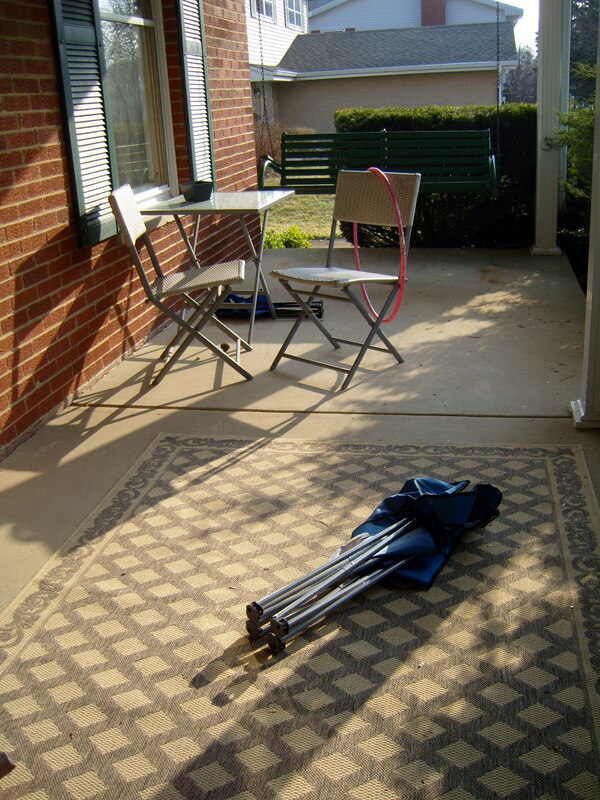 I wiped down the tables and chairs and dragged the porch rug out of the basement. I even cleaned the light fixtures. 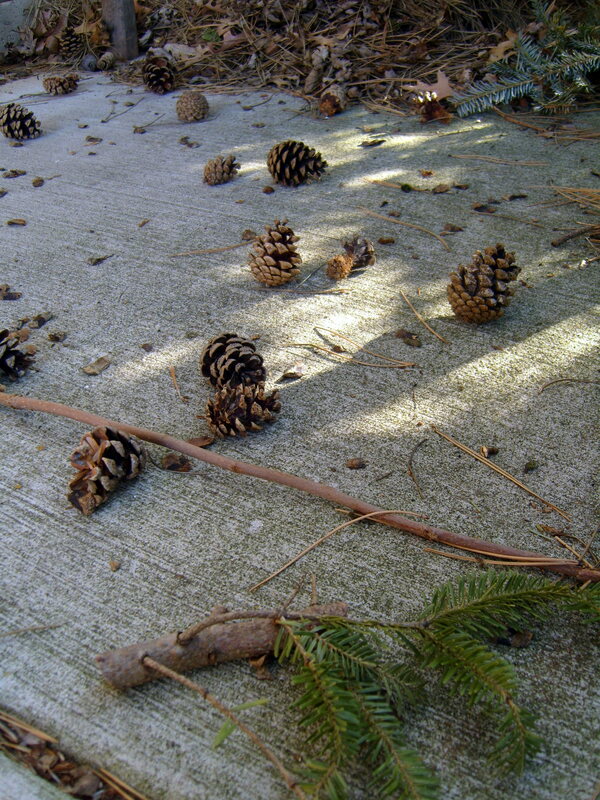 A couple hours after I set the chairs at precise angles and swept all the pine needles from the concrete, half a dozen kids gathered, lounged on the porch swing, scattered pine cones, doodled with sidewalk chalk, and tossed each other’s shoes into the hedge. I love having a front porch. You would find me on that rocker all the time! I paid $7 for that rocker, spray painted it, and rocked on it all last summer! I need to put the cushion back on for spring. It’s a great spot to take the laptop and still keep on eye on the kids playing outside. I love your porch. 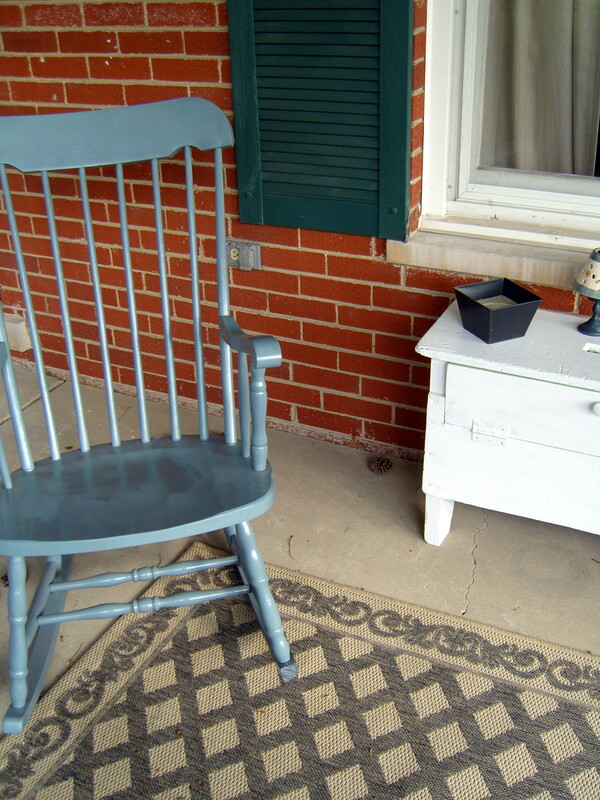 That reminds me, I need a new chair & some color on my doorstep, too. Enjoy the rockin’!